The 3C Company presents an address that truly reflects your spirit. Lotus 300 is a selection of exquisite condominiums, crafted within the framework of green architecture, especially designed for the select few. Limited to an exclusive 300, these apartments are nestled amidst the lively suburbs of Sector 107, Noida and are spread over an area of approx. 10 acres. Experience a perfect medley of inimitable indulgence as this opulent residential estate showcases 3 & 4 bedrooms high-end luxury apartments and duplexes in varied options. A cheerful mind, playful deeds, a wholesome experience and a relaxed soul, that is CLUB 300 for you, your tranquil escape from hard day schedules. Set in a pristine, environment friendly setting, spanning over acres of lush landscapes, Lotus 300 is a dream created with a verdant vision. Take a stroll or simply glance through the beautifully landscaped gardens lining broad avenues. 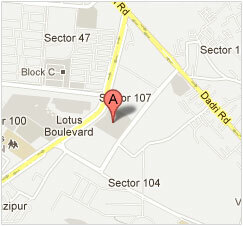 Feel surrounded with a whiff of freshness within the lush premises of Lotus 300.